We are a die-casting mold manufacturer. We have four locations in Asia. Each manufacturing site conducts planning,designing,producing　and testing of molds to serve our customer needs and provides the best aftercare service. Same high-quality at each of our four locations for customers. Provide optimal molds, utilizing strengths unique to each location. Our support system provides prompt service to reduce any inconvenience. Customers are able to order with confidence. Main Customers AISIN Seiki Co.,LTD , AAC(America) , YAMAHA Motor Co.,Ltd. 1979.8 MEIWA Co.,Ltd.was founded in Kawagoe-cho in Mie-gun. Started the designing and manufacturing of Die-Cast Mold. 1990.11 MEIWA Co.,Ltd. was incorporated and capital was increased to \15 million. 1992.5 MEIWA Co.,Ltd. head office relocated to new factory in Komono-cho,Mie-gun. Capital was increased to \24 million. 1995.5 MEIWA Co.,Ltd. provided technical support to companies in Thailand. 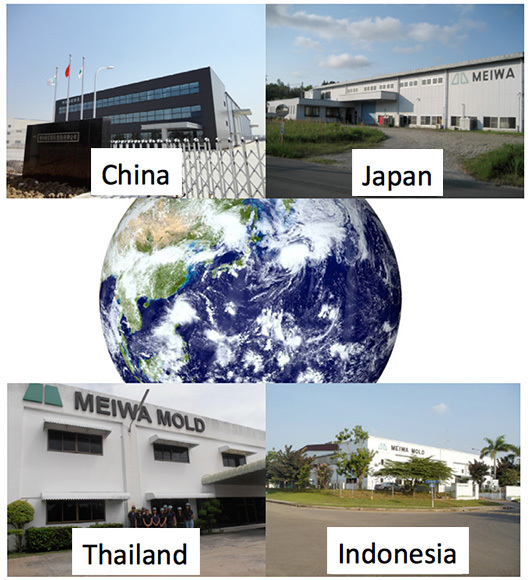 1997.1 MEIWA MOLD (THAILAND) Co.,Ltd. was founded in Thailand and develop die-cast and plastic molds. 1997.8 Capital was increased to \48 million. 2002.1 PT.MEIWA MOLD INDONESIA. was founded in INDONESIA and develop die-cast and plastic molds. 2003.1 Capital was increased to \60 million. The capital entried by Nagoya Small and Medium Business Investment & Consultation CO.,LTD.